I made this for the weekly recipes I write for Hans India. It turned out fabulous even if I say so myself! I took inspiration from my dear namesake’s recipe. Who by the way, visited me last month from Singapore, baby A and husband in tow. We spent the whole day together, talking, shopping, talking, eating, talking and shopping some more! What can I say, apart from the fact that we share the same name, we apparently have a deep abiding love for our voices. After we were done with all the talking and other stuff in between, we headed to my place, to be joined by her child and our respective spouses for a lovely evening that ended too quickly at roughly 3 a.m. These are the things blogging has given me…friends…for life. Here is the recipe. Make it on a day when you are bored of plain fried potatoes. The coconut and red chillies really jazz it up. Tastes best with hot rice and dal or rasam. 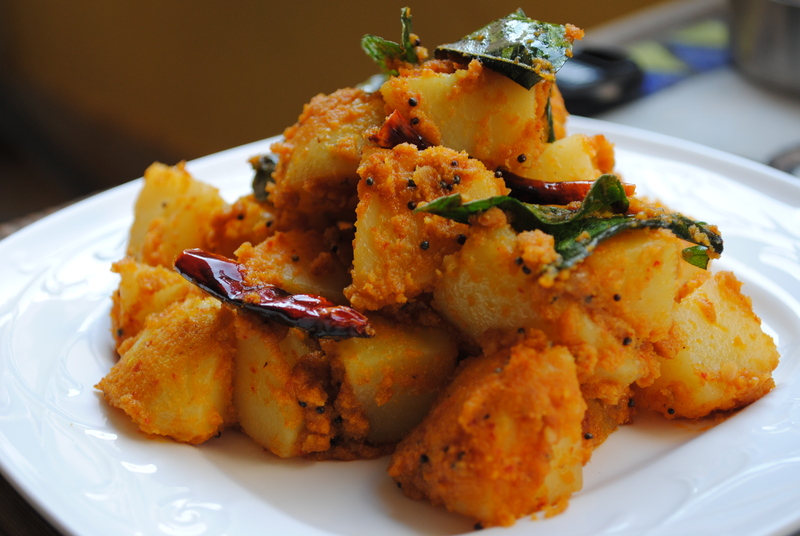 Sukke is a semi dry preparation made with freshly roasted masalas. Dry roast the fenugreek and coriander seeds in a pan. Grind them along with the coconut, red chillies, turmeric, tamarind paste and a little bit of water to a smooth paste. In a pan, heat the oil, splutter the mustard seeds, curry leaves, add the asafetid. Add the potato mixture to this and a little water if needed. Cook this covered, stirring a couple of times for about 5 minutes. Remove the lid and cook a few more minutes till it is almost dry. Serve hot with rice and sambhar, dal or rasam. 1st time here. amazing blog dear. Happy to find you. Tamarind paste in potato bhaji..slurp! adds the right kind of zing to the already terrific potato!